If you frequently work, live, or adventure in the outdoors or could use a handy, easy-to-use fire starter kit then you’re in the right place. We understand how important and even life-or-death it can be if you’re hiking or camping in the outdoors and don’t have a reliable method of starting a fire to keep warm, cook food, and keep the predators away – even those pesky mosquitoes! We’ve selected the best-rated, most dependable, reliable, and practical fire starter kits that are not only portable but easy to attach to your key chain and won’t add weight to your likely already heavy backpack or load. Read on to learn more and find the best fire starter kit reviews for you for surviving in the wilderness or in emergencies. This is considered by us the best survival fire starter on the market! The Light My Fire Swedish FireSteel 2.0 Army Fire Starter Kit is a great choice and we’ve rated it as our best survival fire starter because it’s efficient, reliable, and made durable for even the most difficult and severe weather conditions. The lanyard included, although maybe insignificant to some, is considerately long, and makes it easy to hook onto your key chain, bag, or even pants. It is durable, and this does make a difference for both access and convenience when you are backpacking or trekking outdoors and need to start a fire fast. The Light My Fire Swedish FireSteel 2.0 Army Fire Starter Kit produces magnesium shavings that are easy to shave off into a pile, and is flammable enough to stand up against most weather conditions – of course it’s still important that you provide adequate shelter and protection from the wind as much as possible to ensure flammability and productivity when using. This Survival Fire Starter is great because it’s built tough, is simple to use, and is an overall good product with great reviews and customer feedback. It is, of course, recommended that you or whoever you purchase this survival fire starter kit for familiarizes themselves with basic fire-making skills, as this rod and striker nor any other fire starter product could possibly do all the work necessary. This includes properly collecting and preparing tinder to use, as well as properly kindling – with larger wood or a flammable pile – that will keep your fire going for longer and remain sustainable. So many people choose this survival fire starter kit in particular because it’s got very powerful sparks, will work fresh out of the box is typically 3 strikes or less, and is sensible when using. All that’s required of you is to point the rod and striker in the necessary direction to ensure the sparks fly towards and onto your tinder to get the fire going. As it’s built out of magnesium and other strong metals and material this on-the-go fire starter will easily last over 10,000 strikes or years to come. Consumers have reported back that even in the worst conditions, including high altitude and very cold weather that it still works efficiently. Light My Fire is a well-known brand and is notorious for its product being one of few survival fire starters on the market that produce the largest, consistent fire sparks necessary to protect you from the weather and cook your next meal. This is a must have for every outdoors man, and is equally useful if you want to simply use it for starting a BBQ or fire out back to roast your marshmallows. Thanks to its light-weight build it’s not bulky or heavy, which also lightens your overall load and makes it easy to throw in with your survival kit if you’re carrying one. 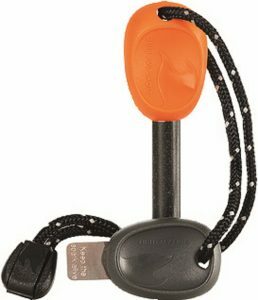 This survival fire starter also comes with an emergency whistle which is a nice add-on, and maximizes security and your ability to both survive, gain someone’s attention, or ‘make noise’ necessary to signal for help or a rescue. 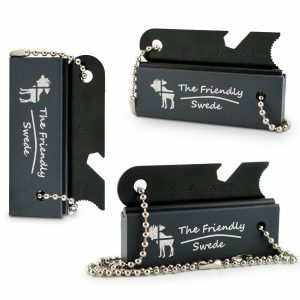 The Friendly Swede Magnesium Alloy Emergency Fire Starter Blocks design and technology are based on using metal strikes with responsive and flammable magnesium blocks to produce sparks. In comparison to other magnesium block products and survival fire starter kits, this product uses a solid form, increasing safety while also maximizing efficiency when stroke with the included metal strikers. The amount of friction is amplified and as it includes multiple fire starter blocks, this is our top choice for the best survival fire starter for the money. Outdoors man, emergency personnel, volunteers, and backpackers alike enjoy this fire starter because it’s simple to use and works when you need it. The magnesium bars are embedded with flint, so when you’re in wet conditions or in high altitude and your matches, waterproof matches, and butane lighter stop working you can count on this fire starter to keep going. This survival fire starter kit also includes small chains to connect and safely keep the strikers and blocks together for convenience. 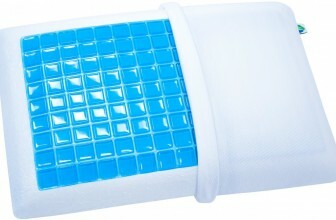 It is also waterproof, which is great for those traveling in wet conditions, or worse during snow season. Even in wind, this fire starter kit is reliable, and the simple sparks to flint process work smoothly. And with cold materials like wood and kindling, it’s still flawless and produces a strong enough flame that will last, and not ‘flash’ – or burnout abruptly and unexpectedly. The included striker can also be used to open your ‘frosty beverage’ if you’re out camping, or enjoying a nice fire with the family outback. Not only have consumers reported that The Friendly Swede Magnesium Alloy Emergency Fire Starter Blocks are friendlier, softer, and easier to use in comparison, but that they also function how they were designed (guaranteed by consumers). As there are unfortunately many ‘knock-offs’ or illegitimate magnesium survival fire starter kits on the market, it’s nice to be able to invest in and reap the benefits of a well built, safe, and convenient fire starter. The piece of hacksaw blades that are included with this fire starter kit are effective, and for any experienced camper or backpacker, you know how frustrating it can be and how easy it is to dull down your knife or blades trying to get a magnesium block going. Using other types of blades or outdoor knives can also make it difficult to scrape off the magnesium to make a pile in comparison to the actually included blades which were built durably, and especially for this exact purpose. In conclusion, if you’re looking for the best survival fire starter kit for the money, The Friendly Swede is an awesome company to trust for this type of product. Consumers have also reported wonderful and punctual experiences interacting with this manufacturer, and that the customer service was ‘right on the money’. So whether for your next trip or emergency kit, this is definitely a survival fire starter kit to not go without. The Gerber Bear Grylls Fire Starter is our top pick for being the best survival fire starter on a budget because true to it’s brand and name, it is a rugged, reliable, and easy to use survival fire starter kit with plenty of extras. And with Gerber Bear having over 70 years’ experience in outdoor knives and equipment it’s understandable why so many consumers flock to and are happy with this survival fire starter. This survival fire starter was built with safety in mind, so it is considerably larger than others, or, magnesium block-based fire starters for example. It’s built compact, its case is airtight, and is optimal for use for the outdoorsman, trekkers, camping, and any types of emergencies that require a lighter and fire. Thanks it’s solid and durable casing the ferrocerium rod and metal strikers are waterproofed, and it even comes with an extra compartment in the cap to store cotton balls or keep your tinder dry. The Gerber Bear Grylls Fire Starter also includes a really helpful guide about how and what to use to catch dew (for drinking water later on or other purposes), or even how to signal for help in the alpines. Thanks to its affordable price buying more than one is made simple and offers extra efficiency and safety for your next outdoor adventure, camping trip, or even outdoor BBQ and fire pit. Due to it’s larger size, depending on how big your pockets are or what kind of pants and jacket you’re wearing it may be best to keep this fire starter in your backpack or other storage location. 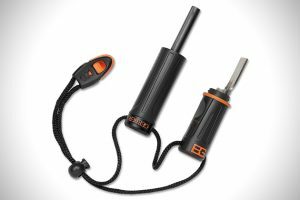 The Gerber Bear Grylls Fire Starter consistently produces big sparks and for some consumers is more practical, easy to use, and efficient than magnesium fire starters. The average heat temperature that this fire starter gives off is approximately 3,000 degrees Fahrenheit – which is substantially high and effortlessly guaranteed to start a spark for a fire in nearly any weather conditions, altitudes, or temperature. Happy customers of the Gerber Bear Grylls Fire Starter include outdoors man, trekkers, ‘preppers’, and those looking to have an emergency backup source of fire. The ferro rod is built very well and is sure to last you many adventures to come. Overall this is a desirable survival fire starter for those on a budget because it’s inexpensive, includes a survival whistle, and with a flint and steel type design consumers that often hike in the snow and rain can maximize off its ability to preserve and protect the much needed and valued flint. Even as inexpensive as this fire starter is, it’s not of poor quality in comparison to other cheaper products on the market, both steel, and rod or magnesium based fire starters. It works to give off sparks in as little as one to two strikes, just make sure you angle it right and have prepared adequate tinder or a fuel source. An overall very ergonomic survival fire starter, just don’t forget to nurture or ‘kindle’ your fire. Lastly, the lanyard cord is a nice final touch, and consumers report great satisfaction and years of use without failures or challenges using this fire starter. Before backpacking into the wilderness or getting yourself stuck in an emergency situation, may you be stranded or just out of reach to local assistance or support, a survival fire starter kit can mean the difference between survival and death. We know it sounds extreme, but if you consider the extreme altitudes, temperatures, and weather conditions of the outdoors it will all make sense when put together. Selecting the most practical, effective, and if on a budget affordable survival fire starter doesn’t have to be an impossible mission. Going with a survival fire starter that is going to get the job done and hold up against the harshest conditions and still be convenient can serve not only as a light source, but also heat to cook food, and of course heat to stay warm – no matter the condition or circumstances. The idea of ‘rubbing two sticks together’ to make a fire goes back hundreds if not thousands of years and is an age-old considerably ‘101’ trick to making all of your efforts count in the harshest conditions, to even a friendly, safe camping trip or fire pit in your backyard. Selecting the best made and efficient fire starter is important, as it deals with fire, and some can cause harm or worse an uncontrollable fire if used improperly or without practice and guidance. Knowing your tools are critical to survival and success in the great outdoors. What Makes the Best Outdoor Survival Fire Starter Kit? -Ease of use, and the total amount of strikes or longevity in the fire starter kit you invest in. How easy is it to use your fire starter, and how many strikes or times will it take to really get the sparks ‘flowing’? -Safety, which cannot be expressed enough. So knowing who makes your fire starter kit, their reputation, and feedback from consumers is critical to ensuring you stay safe. -Durability, which is very important when trekking or going on outdoor adventures as weather conditions and temperatures can change – so the materials your fire starter and it’s casing is made of is a very important variable. In fact, some cheaper or ‘knock-off’ brands of fire-starters actually rely on the blocks being glued onto a plastic or metal piece, which can often fall off and cause a lot of troubles or even inability to use. Steel, magnesium, and iron are all very reputable strengths and durable metals that are trusted for outdoor use and in emergencies. -Last but not least, maximize your purchase by investing in a fire starter with not only the reputation to back it up, but also one that’s unique and includes other helpful tools or pieces if possible, such as a lanyard (for convenience), extra striking rods (just in case), an emergency whistle (always helpful), and even an outdoors short guide or “How to” for using the fire starter kit you’ve chosen. We rated the Light My Fire Swedish FireSteel Fire Starter as the BEST survival fire starter and it should come as no surprise that this top pick was developed for, used, and is trusted by the Swedish Department of Defense. This survival fire starter is definitely ‘boyscout-friendly’, easy to use with just a few practice strokes, and safe enough to take with you and use on the go in nearly any imaginable weather condition or high altitude. The Light My Fire Swedish FireSteel Fire Starter is small, light, and built for the outdoorsman, those going camping, trekking, or for use of emergency. 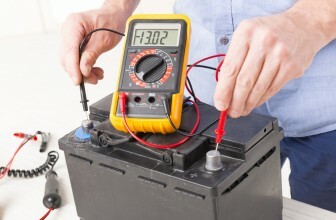 Many customers have even reported adding this to their ‘bug out’ kits at home – ‘just in case’. This fire starter produces huge sparks and is excellent as it doesn’t wear down its flint very quickly – so you can expect to be happily using this fire starter for years to come. This Light My Fire survival fire starter is made of dense, and heavy enough hard materials that it can withstand wear and frequent use outdoors – which is critical for hunters, campers, trekkers, and even emergency personnel. 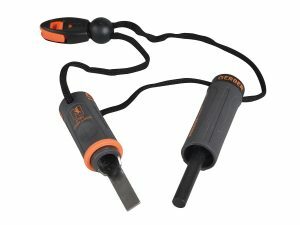 With a dense, heavy, hard handle and soft rod the ease of use and convenience with this fire starter is great. The flint bar will easily work with the back of a knife or saw, however, the strikers included are reported to work very well, consistently over time, and hold up in even windy or rainy conditions. For those looking to get a little practice, this is a great fire starter to use for making a BBQ outback, or a shorter, local camping trip. With a nice spray of sparks from the firesteel, it’s easier to angle and use in more or less one swift motion. The material and shavings from the firesteel are very convenient and helpful ‘on the go’ as they are very flammable. It’s important to always ensure you’ve either prepared and have ready reliable, dry tinder or pick it up along your next outdoor adventure so that you can create and maintain your next fire with ease. Cotton balls and Vaseline work well, as do dry tinder pellets, and of course dry leaves or twigs – also known as ‘tinder’. Some customers have complained that the whistle doesn’t work well, but others have been quite satisfied. Ultimately, the whistle is just an added bonus and is not designed to be the most powerful or efficient, but good enough to get attention or emergency help when you need it. Also, the best emergency signaling method in most instances while out backpacking or trekking would be a fire signal. A few customers have also reported that the lanyard is too short, but a more sturdy, or dynamic lanyard that meets your needs may be purchased separately if it’s truly an issue or requirement for your trip. Lastly, for some, the striker and rod are a little small and hard to use. But, the good news is over time they will likely become much easier to use, and striking the rod will become second nature for you. Just try to practice and get the right angle a few times before you go out on your next official trek or backpacking trip. The Friendly Swede Magnesium Alloy Emergency Fire Starter Blocks are our top pick for the best survival fire starter for the money because you receive a multi-pack of very reliable, durable magnesium blocks and strikers that are long-lasting and easy to use. These fire starters are very light, and come with three 3” x 1” magnesium bars and will not be inconvenient or uncomfortable to pack in your ‘bug-out’ bag, fanny pack, or backpack. The magnesium bars and strikers are completely safe to be stored and travel this way. That’s because although magnesium flint is extremely flammable, it’s actual solid form is not. Survivalists, trekkers, and everyday customers were very satisfied with how reliable and accurate these fire starters are. They also include convenient, durable steel chains that connect each pair, which means more fire starters in different places for different emergencies or trips should you wish. These survival fire starters are both waterproof and indestructible. A really great purchase for the money and they stand up very well in windy, snowy, and even rainy conditions. Thanks to the magnesium blocks and striker combination you can exact consistent flames of around 1,500 degrees Fahrenheit – a surefire way to get your fire going, just have your kindling ready! These fire starters are well-liked among consumers, and people have happily reported back that in as little as one strike you’ll get better a nice, powerful, and solid ration of flames. The strikers can also be used as a small saw, which is especially helpful when trekking or out in the wild. Not many fire starter kits can say or have their customers report that even wet kindling can be ignited with the right amount of ‘magnesium flakes’ and a little elbow grease. In comparison to competitors or other generic versions this fire starter kit is much softer and easier to use without much effort – just be sure to practice a few times and perfect your angle just as with other fire starters. For those new to fire starting or using magnesium blocks, you’ll find especially useful striking off enough magnesium flakes about the size of a penny before attempting to light. Always make sure you keep your tinder, paper, or cotton balls (helps to soak them in Vaseline) ready to ignite, kindle, and maintain your fire. 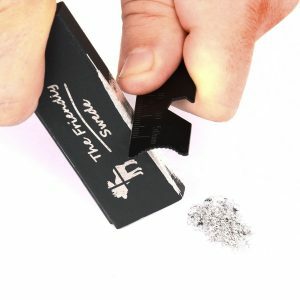 Few customers of the Friendly Swede Magnesium Alloy Emergency Fire Starter have reported that it’s hard to get the first few sparks, or that it isn’t as consistent as advertised. The best workaround for this is to first, very important, ensure you wipe off the protectant oil that each one comes standard with in it’s respective packaging. Secondly, it’s important to ‘wear down’ the magnesium bars a bit to really get it exposed and responsive – don’t be afraid of abrasions, magnesium is a very solid, durable metal. Also, for those who’ve done it before or plan to do it with this fire starter, trying to use a pocket or outdoors knife can be frustrating when using as a ‘striker’, as it wears and ‘dulls’ down both your knife but also the magnesium bar or ferro rod. Often, it leads to not getting much, if any, magnesium flakes that can actually be used to ignite. That’s why it’s so important, and helpful, that this fire starter includes durable, effective strikers. This is a great product for survivalists and preppers, and definitely the best survival fire starter for the money. Any survivalist, outdoorsman, or backpacker likely knows the name Bear Grylls pretty well. It just so happens that the combination of many combined years manufacturing outdoor tools and the knowledge and influence of Bear Grylls has been combined to create – the ultimate survival fire starter on a budget! This is by no means some sort of sales ‘hoax’, nor an ‘As Seen on T.V.’ type of product. In fact, many loyal Gerber customers that have been purchasing multi-tools a lot longer than many of these survivalist shows have been around having been both very excited and relayed positive feedback on this survival fire starter kit. The Gerber Bear Grylls Fire Starter is very compact, sturdy, and unfailingly watertight. This is great for tougher weather, temperatures, and altitude. The fire starter itself is very easy to use, and Gerber has even included an S.O.S. survival guide and a 10” ruler on the side for just in case measurements. The built-in tinder cap at the top is really cool, and not something really seen before on this market. It can hold multiple cotton balls or other tinder so you can keep it dry as you adventure, yet remain able to successfully start a fire later on with minimal effort. Thanks to it’s rugged and tough exterior case, outdoorsmen take comfort in knowing that the vital ferrocerium rod and the metal striker will always be safe against damage and dry from rain or snow. This fire starter is very easy to hold, includes a whistle, and the flames reach an estimated 3,000 Fahrenheit during use. Some customers have even reported that the flames from this fire starter are larger and more powerful than that produced from a magnesium block and striker. 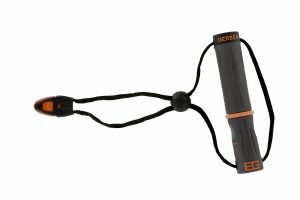 The Gerber Bear Grylls Fire Starter also includes a whistle for emergencies, or even to use to scare away unwanted predators in the middle of the night – or day. This is definitely a well-made fire starter, and given its high quality is for good reason our top pick for the best survival fire starter on a budget. Thanks to its very affordable price it’s also more practical to buy more than one, or a ‘backup’ just in case. 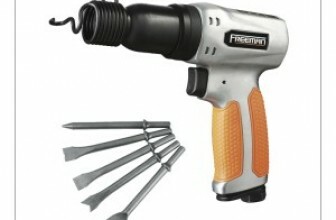 This is truly a quality built, easy to use flint and steel setup fire starter. In comparison to other fire starters on the market, happy customers have stated that due to its nice tight grip, thick flint rod, and strong striker that it will last much longer, and under harsher conditions. Some customers have complained that the lanyard is not long enough. However, many backpackers and trekkers don’t want such a long – around the neck or waist – lanyard as it can be a safety hazard. It should be understood that fire starters in general often come with protective sealant oils, or in this case a few extra ‘layers’ so it’s necessary to strike away several times to clear the top layer before getting the most consistent, profitable sparks from this fire starter. And of course, we can’t emphasize enough how important it is to be preparing and using practical, dry, or prepared tinder to maximize the results of any fire starter during use. Some may feel that a steel and rod fire starter blows more sparks in a ‘general’ direction as opposed to a concentrated area with a magnesium block fire starter. But, keep in mind, everyone is subjected to different experiences – and wind understandably also plays a large role. What’s the Best Survival Fire Starter Kit for You? Whether you’re looking to start a fire in high altitude with low oxygen outside, extremely low temperatures, rainy, or even snowy conditions these fire starter kits are an all-around great solution for starting a fire with ease – and confidence. Each kit includes the basic rod and striker, although some are made from different metals such as pyrophoric allows like magnesium (most common), cerium, lanthanum, iron, and come with efficient stainless steel striker blades. 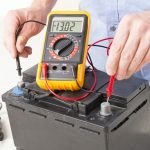 These fire starter kit reviews are designed to demonstrate each one’s ability to maximize the use of friction to start a fire – with one even being trusted and originally designed for the Swedish Department of Defense. We have presented here the best, most affordable, and optimal fire starter kits for your money and are confident you’ll now be better prepared to make the best choice for you and your outdoor adventure needs. Remember, when it comes to purchasing a fire starter the key goals should be maximizing safety, convenience, efficiency, and last but not least flammability.